At Targetprocess, we strongly believe that your project management tool should adapt and grow together with your company; it should be easy to adjust the tool’s configuration to fit your current process, and to update it later when your company process is changed. That is why we try hard to enable you to follow your target process. Previously we introduced the Team Workflow feature which allows teams to create and use their custom workflows for all the entities in Targetprocess which do not affect other teams. However, there are many other possible scenarios for organizing the collaboration of multiple teams in your company. For example, several teams might need to work on the same entity. Until now, they used different workarounds for this purpose: they might have created duplicate entities or used relations to link several teams to one item. 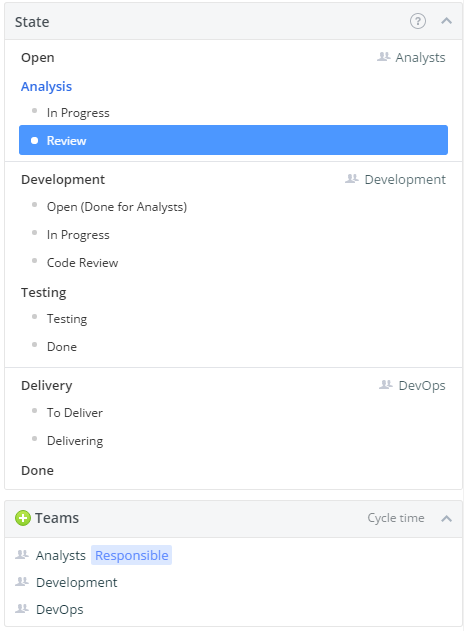 We are proud to announce our new feature: Workflow Management for Functional Teams. The new functionality will be interesting for companies who have teams working sequentially. Accounting, Marketing, Designers, Development are examples of such teams. They are often called functional teams. From now on, several teams can work on the same item - e.g. a feature or a user story - one after another. So, the final state of the item in the workflow of one team is its first state in the workflow for another team. The work is started by the Analysts. When the Analysts move a user story to the state which is final for their team, the Development team takes the responsibility for it. Any team can create their own view by choosing the Team State for the vertical lanes in order to see this team’s part of work only. For more use cases and FAQ, please visit https://www.targetprocess.com/guide/settings/states-workflows/multiple-teams-use-cases/ or contact our Support team. If you would like to check out this functionality for your teams, don’t hesitate to email support@targetprocess.com with a request to enable this feature for your account. We’d love for you to try it and let us know what you think!